READY TO WEAR. READY TO STARE. Get dressed with lash looks. 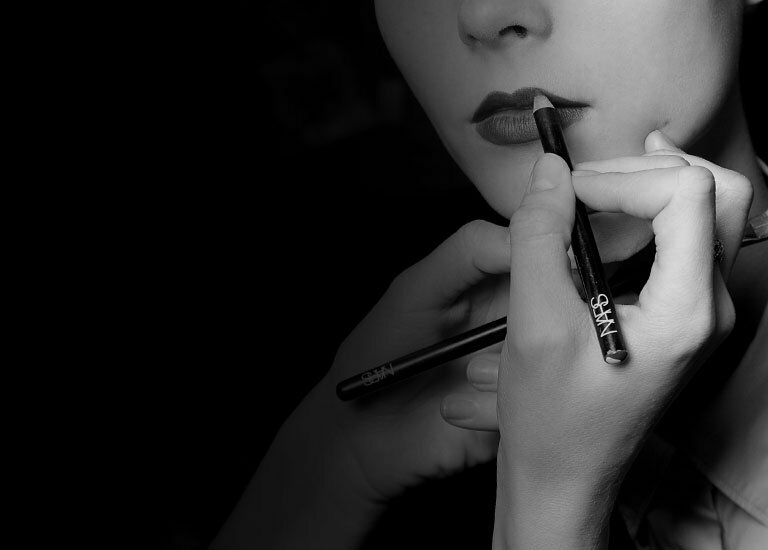 NARS Eyelashes intensify and transform your eyes to create an effortlessly sophisticated look. Designed by François Nars to complement any eye shape. Versatile. Reusable. Made for everyday use. Choose lashes based on the effect you are trying to create–more volume, length, etc. Choose a pair that complements the natural shape and curl of your lashes. If needed, cut lashes to match the natural shape of the eye. The band should not extend past the natural lash line. If the band is too wide, cut at the sides to fit. Cut into the lash where you want to create a more natural-looking “fringe”. TIP: Always cut into the lash; never do a blunt, straight cut as the result will not look natural. Apply eyelash adhesive (NARS recommends Duo Eyelash Adhesive, which is available for sale in NARS Boutiques and NARScosmetics.com) along the base of the eyelashes. Once they are applied, apply mascara to the entire lash look to create a cohesive effect. Add eyeliner on upper lash line (over the band) to ensure lashes look natural and seamless. To remove, start from the outer corner of the eye and gently peel off towards the inner corner of the eye.